Parenteral solutions and isotonicity are essential concepts that every pharmacy student should know. Today, we examine these two concepts in detail – reviewing six key examples to help you get to grips with this important topic. Knowing how to calculate parenteral solutions and isotonicity is a fundamental part of medicinal formulations – equipping you with the necessary skills to calculate the factors involved in injection calculations. When you’ve finished studying this section, take the time to review our additional pharmacy calculations articles. A patient needs to be administered 1L of 0.9% saline solution over an 8-hour period. Assuming that 1mL is equivalent to 20 drops, how many drops-per-minute must be administered to the patient? First, we need to convert 8-hours into minutes, that is to say – 480 minutes. If there are 20 drops in 1mL, it means that 1L contains 20,000 drops. In other words, we need 480 minutes to administer an infusion of 20,000 drops. If we divide 20,000/480, we identify how many drops-per-minute must be administered. In this case – it’s 41.6, or 42 drops per minute. Drug X has a recommended flow rate of 2-3mL/minute at a concentration of 5mg/mL. Drug X is only available in 500mg vials for dilution in glucose 5%. The IV administration is calibrated at 20 drops/mL. Using only 1 vial of drug X, what volume of glucose 5% solution must be used and how many drops per minute must be delivered if the flow rate is 3mL/minute? How long will the infusion take? A vial of drug X contains 500mg – meaning it must be dissolved in sufficient glucose 5% to produce 100mL of solution at the desired concentration of 5mg/mL. If there is 20 drops in 1mL, 3mL has a total of 60 drops. As a result – 3mL is delivered in 1 minute, meaning the IV infusion should be set to 60 drops per minute. Given the total volume to be administered is 100mL, it will take 33.3 minutes to deliver this volume (100mL/3mL). A 56kg female patient needs an IV infusion of amphotericin at a dose of 250 micrograms/kg. However, the concentration of the final solution must not exceed more than 100 micrograms/mL. A vial of amphotericin contains 50mg. Calculate the dose of amphotericin needed and the volume of IV solution required by the patient if the solution contains the maximum concentration. If a solution has to be delivered in 2.5 hours, what is the rate in mL/minute? If a 50mg vial is used to prepare the IV solution, what is the total volume of solution prepared? Given that 250 micrograms is needed for every kilogram, it means that we need 14,000 micrograms of amphotericin. The second question asks us to find the volume of IV solution required if the solution contains the maximum concentration of 100 micrograms/mL. If there are 100 micrograms needed per every mL – it means 14,000 micrograms needs 140mL to meet this maximum concentration. The final question asks us to consider a 50mg vial used to prepare the IV solution – to determine the total volume of the solution prepared. We need to convert 50mg to 50,000 micrograms (units must be consistent). If we need to have a maximum concentration of 100 micrograms/mL, it means we need to dissolve the 50mg vial up to 500mL of solvent to maintain this concentration. However, in terms of the infusion, we only need 140mL to be administered to the patient. 50mg of furosemide needs to be administered by slow IV infusion at a rate not exceeding 4mg/minute. Furosemide injection contains 10mg/mL. Calculate the volume of furosemide injection needed and the infusion rate i.e. mL/minute, if the patient is to receive the correct dose. 50mg of furosemide is needed, therefore we need 5mL of furosemide injection. 5mL of furosemide injection must be administered at a rate not exceeding 4mg/minute. If the rate must be 4mg/minute – it means a 50mg dose needs 12.5 minutes. In other words, it will take 12.5 minutes to deliver the injection solution at a rate of 4mg/minute. Given that 5mL of furosemide injection is needed (as above), it means(5mL/12.5 minutes) the infusion device should be set to a maximum of 0.4mL/minute. A 100mg dose of an analgesic needs to be infused over a 5-hour period. The drug is available in 1mL vials, each containing 50mg of the drug. The only syringe driver available has a 20mL capacity, delivering at a constant rate of 2mL/hour. How many vials of the drug and what volume of diluent is needed to fill the 20mL syringe so that the drug is delivered at the correct concentration? The syringe driver can be set to automatically stop after 5 hours. If the 100mg dose needs to be delivered over a 5 hour period, then the patient needs 20mg of this drug per hour. The rate of delivery is 2mL/hour – meaning 2mL of the solution will need to contain 20mg. The syringe has a capacity of 20mL, so we need 200mg of drug. We’re told that the drug is available in 1mL vials, each containing 50mg of the drug – therefore we need 4 vials. If 4 vials contain 4mL, and the syringe has a capacity of 20mL, we require 16mL of diluent. Calculate the amount of sodium chloride that must be added to the following formulation of nasal drops to make the final solution isotonic. A 1% w/v solution of ephedrine hydrochloride depresses the freezing point by 0.169 degrees Celsius. A 1% w/v solution of sodium chloride depresses the freezing point by 0.576 degrees Celsius. 1% w/v ephedrine hydrochloride refers to 1g per 100mL – we’re dealing with half of that, 0.5g. This means the freezing point depression will decrease by half to 0.0845. In other words, ephedrine hydrochloride depresses the freezing point to 0.0845 below 0 degrees Celsius i.e. -0.0845 degrees Celsius. An isotonic solution freezing point – with 0.9% saline – is -0.52 degrees Celsius. This means the added sodium chloride will need to depress the freezing point of the ephedrine solution by a further 0.4355 degrees Celsius. z works out to be 0.756 – meaning that 0.756% w/v of sodium chloride must be added to ensure the final solution is isotonic. 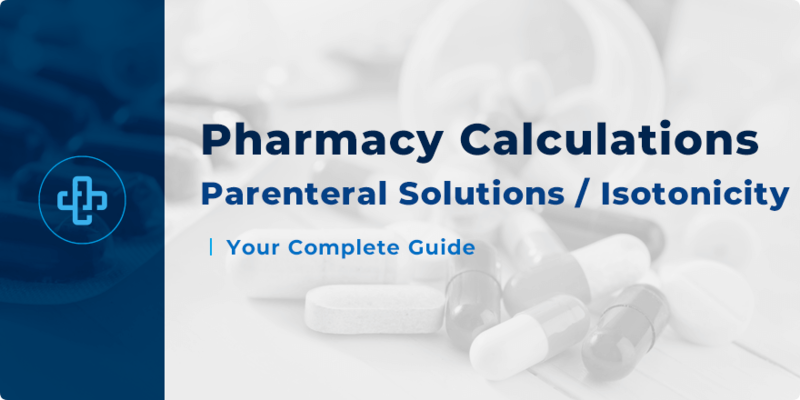 Calculating parenteral solutions and isotonicity don’t need to be challenging. Once you understand the bones of the question – what the question is asking, what we mean by parenteral solutions and isotonicity and what approach we can take to address the question – it becomes that much easier. Merely winging it is not enough. You need to have a comprehensive understanding of the theory behind the question before the question begins to make sense. With enough practice though, these pharmacy calculations become second nature.